When trying to determine how many exit lights your building needs, there is no easy answer or calculation. As is often the case, the only simple answer would be: it depends. This is partly because at least five regulating bodies govern exit sign requirements: OSHA, NFPA, JCAHO, International Building Code and International Fire Code, not including your local authority having jurisdiction (AHJ), whose requirements you must also follow. However, there are other factors as well. Perhaps a better question than, “How many?” would be, “Where do I need exit lights?” as this question would answer the former. What Determines the Number of Exit Lights Needed? Every building’s layout is unique, and it is the size and layout of your building that play the primary role in determining how many exit lights you will need. The number and location of rooms, corridors, doors, floors, stairwells, elevators, etc., all will influence the number of exit lights required. So, when trying to determine the placement and number of exit lights you need, your safest option is to ask your authority having jurisdiction (AHJ). Between the many governing regulations and unique characteristics of each building, your AHJ will best be able to accurately identify where exit lights need to go and how many are needed. Exit: an unobstructed pathway for the purpose of exiting from any area within a building out to a safe and public way. When the exit and/or the pathway to the exit is not apparent, exit lighting must be used along the access ways indicating the direction leading to the nearest exit. The distance between exit signs in an access corridor cannot exceed 100-feet or the sign’s viewing distance, whichever is less. 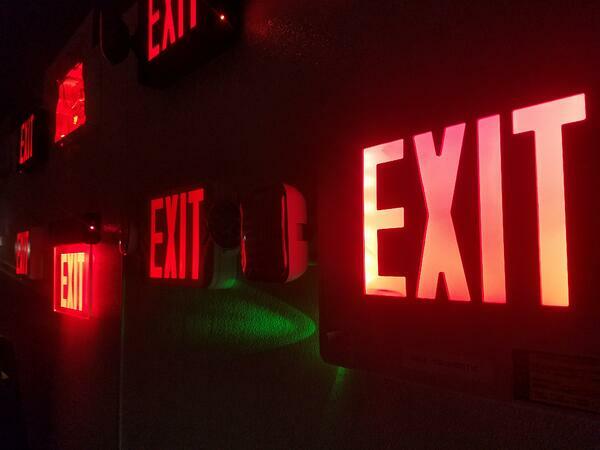 Every door and/or elevator leading to the exit route or exit must be marked with an exit light. Exit discharge points (doorways leading outside onto a public way), other than the obvious main entrance and exit way, must be marked with an exit light. Any doors or pathways along an exit access route that do not lead to an exit must be marked with a sign reading “NO Exit” or “Not an Exit,” or a sign indicating where they lead in order to prevent confusion. There are of course more details and intricacies to these requirements, which you can read further in 2018 NFPA 101, Section 7.10 and in OSHA’s 1910.37. Once all the exit lights have been properly installed throughout your building, it’s imperative to ensure that they continue to work as intended. To maintain your exit lights, Koorsen technicians can help with regular inspections, service, and replacement of existing exit lights. Contact them today for any inspections, service, and/or replacement you may need for your facility’s exit lights.